Please try my friend Jennifer’s Luxury Artisan Skin Care! I want to introduce you to my friend, Jennifer Devlin Waller, and her beautiful line of organic skin care products. 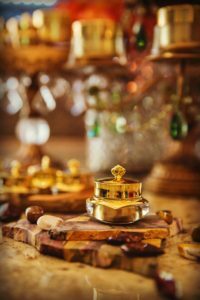 I met Jennifer around five years ago when she started her company “Celtic Complexion” and needed my assistance as an aromatherapist to help formulate her anti-aging and sensitive skin care serums. We have continued working together over the years as Jennifer uses Yoga Flow Essential Oils in her product line. 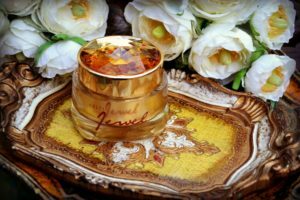 Recently, Jennifer sent me her new anti-aging crème to try called “Celtic Jewel”, and I need to tell you that I love this blend! I have seen changes in my skin so dramatic, that I decided to discontinue my own crème (Celtic Jewel is better and faster) and begin promoting hers! The skin on my neck has tightened and my chest, sun damaged from my early years in the Florida sun, is now free of wrinkles! I just turned 60 years old, and a new acquaintance who does not mince words recently told me that I look 40! What this crème doesn’t have is equally important… Non GMO ingredients, no parabens, synthetic fragrance and it’s cruelty free. As soon as it touches your skin, you will feel the difference. Sea Kelp provides a barrier on the skin to protect it from photo-aging, Co Q10 is a crucial molecule in cell restoration; potent ingredients that delivery these remarkable results, naturally. This creme is a wonderful alternative for those who are too sensitive for professional peels or lasers. It works effectively, over time to re-texturize the skin. Jennifer agreed to offer a sample size of her crème to my customers so that you can see results before investing in her larger size. There’s a limited amount of sample sizes available and this is only in effect until July 1st! Please click here: http://www.celticcomplexion.com/moisturizers/celtic-jewel-limited-edition/, and if you order, use coupon code “yogaflow” (without quotes) to receive free shipping. This coupon applies to her entire product line, including the products I helped her create: Calming Serum and Youth Infusion 7 High Potency Serum (I use this along with the crème). As an aromatherapist and believer in natural products, this is the first time in my nine years in business that I have recommended products other than my own. If you are interested in natural, high quality skin care, please take the time to check out Jennifer’s website at www.celticcomplexion.com.